The Association, originally formed by Agreement in 1926, was created by Samuel Insull, energy mogul and founder of the Chicago electric company Commonwealth Edison. The 1926 founding document provided for the construction and maintenance of a dam at a point near the southeastern downstream flow of the boggy stream through the area. Dredging equipment was brought in to clear the area that would become the lake bottom. Water quickly filled the area and created what is now known as Countryside Lake. In the mid 1920's Insull built a hunting lodge that sits directly on the waters of Countryside Lake. The lodge, now a private home, is one of many residences that surround the lake. When created, the boundaries of Countryside Lake Association encompassed 1800 acres of land. 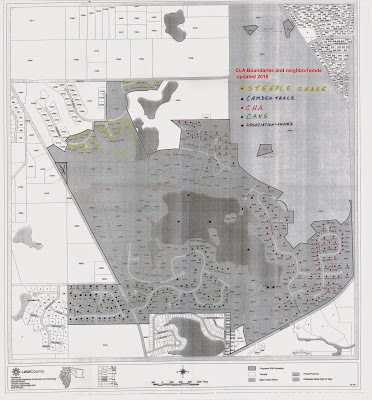 From the mid 1920s up to the late 1960s, much of the acreage remained undeveloped. In 1969 total CLA membership remained relatively small at about 65 members. Through the 1970s additional homes were built, and by 1979 CLA membership grew to more than 90 members. During the 1980s residential development in Lake County and Fremont Township increased substantially. Membership in Countryside Lake Association also began to grow at a faster pace. Over the years, some planned neighborhood developments and individual associations were created within CLA boundaries. Today membership includes 343 members living in a variety of neighborhoods throughout CLA's land area. Click the map to the right for a larger image showing the neighborhoods; Steeple Chase, Camden Trace, CHA (Countryside Homeowners Association), and Countryside Oaks. To the right is a watercolor painting from the 1950's or 1960's with a perspective from the northern shore. Note the lack of development around the lake, the 2 boathouses (the closer of which is still standing), and the size of the moored sailboat. Although several decades of rapid development have changed the surrounding areas of Fremont Township and the Village of Mundelein, the Countryside Lake community has managed to maintain a semi-rural atmosphere that is very appealing to local residents.